I'm back at work this week and can usually be found drinking apples or oranges that I juiced first thing in the morning. It's all part of the New Me regime that I'm punishing myself with after asking for (and receiving) a juicer for Christmas. Juicing hasn't been easy to get to grips with. Everything is frothy and is usually an unappetising shade of green, orange or grey. It's like not only having to detox and cleanse but also to wean yourself off moving your jaw up and down. I need something to munch on. Maybe I'll just talk more? Won't my colleagues be impressed? Some flavours work together and some taste like something you'd be given during a trial in I'm A Celebrity, Get Me Out Of Here. Nothing is properly sweet enough (I have three sugars in my tea) and I can't find "stevia" anywhere (a natural liquid (?) sweetener according to fellow juicers) but, to be fair, I've only asked in one supermarket and they looked at me like I'd grown two heads or suggested they cartwheel down the centre aisle. One beetroot and two carrots yields approximately half a pint of juice which is really quite impressive. One beetroot and two carrots create a juice that looks like a blood transfusion. It is wise to wash your beetroot before juicing it because, if you don't, you can still taste soil nine hours later each time you burp. 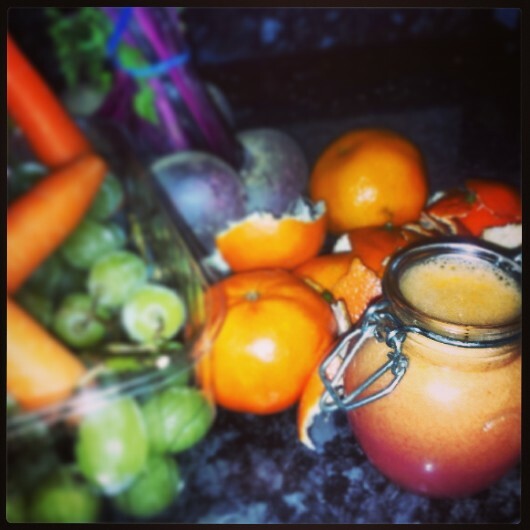 Let me know your favourite juice recipes and top tips! I'm determined to crack this!